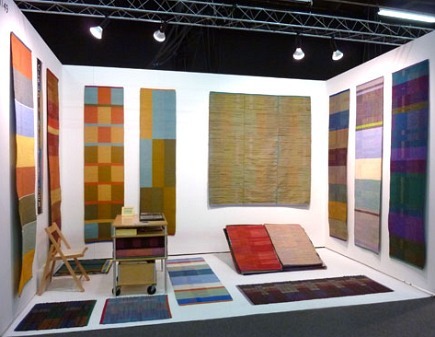 Traditional weaving techniques are interpreted in modern handwoven rugs. I was first introduced to handwoven rugs three decades ago when my parents were living near the Pennsylvania Amish country. Mr Shops and I purchased several rag rugs for our first home. Three children and numerous pets later, they were still going strong. With our first grandchild on the way, I was delighted to run across veteran weaver Claudia Mills’ floor coverings online. Working from her Powelton Village (Philadelphia) studio, Claudia has taken the traditional craft of rag rug weaving and added her own contemporary aesthetic. 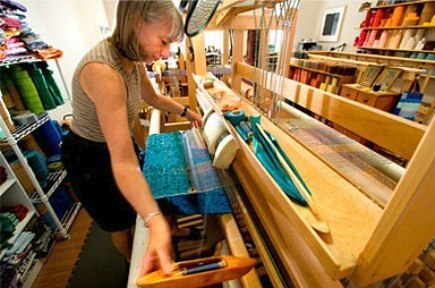 Custom rugs and runners are made from cotton or leather on wooden looms. 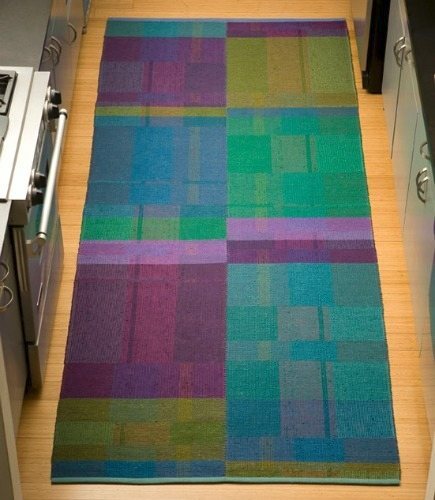 Designed to accommodate any width and length combination, these colorful rugs are based on two foot widths and are seamed together for larger rugs. These woven rugs are not only beautiful but durable, well-suited for any room. Don’t miss the color-block rug featured this week and Cotton Summer Rugs. I’m in lust. Those are magnificent. Much more my style than the usual area rugs. I fell in love with hand woven textiles in my textiles class in college. One of my friends from that class made us hand woven napkins for a wedding gift that I treasure. More my style too, Rhome. I’m a big texture person. Would love one of these in my kitchen between the range and sink. I bet the napkins are beautiful.